Where Do You Fit FIT in? As a Personal Trainer, I’ve come across many clients who fit a certain lifestyle. They are Moms who feel guilty about taking time away from their kids to work out. They are business executives who have to schedule regular appointments with a trainer because they wouldn’t otherwise workout. And they are also college students fending off college weight gain, people who are new to the gym and people who just need that extra push. Exercise is a very personal experience. But we all share the need to strive for something better for our health. Sticking the same workouts will lead to the same results. But how do we change when our jobs, family, friends, emergencies, etc. outline each day? You might be surprised to discover ways to work out that haven’t already thought of. See where you fit in! The early morning feedings, the endless amount of laundry and the race to drop off your children at soccer practice makes for a full day. But maybe in the midst of motherly duties you catch a glimpse of yourself in the mirror and find that your normal size pants no longer feel so relaxed fit against your thighs. You’re a mom after all right? No longer that svelte teenager, you are now forever put into a category of mom pants, baby spit-up and early nights in watching Jeopardy. Get your head on straight and wake up! 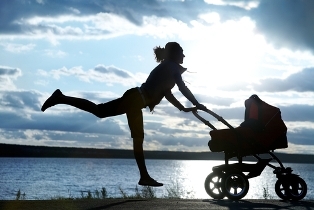 You can be an awesome mom and feel great about your body! Stop choosing to classify you and your body as stuck in some imagined deterioration of youth and beauty. Choose to live in the moment and realize you are beautiful and you do have options! Like any busy person, you have to schedule the time as your time. This will get easier as your kids are old enough to be in school. But if you have children under the age of five in the house you’re likely to not even be aware of what time it is period. 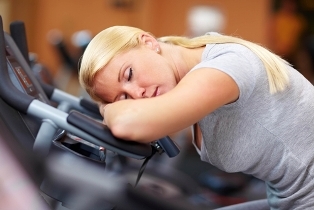 So, a good time to workout at home would be when your baby is about to take a nap. Put them in to a baby carrier that can attach to your body. They’ll be sound asleep against your chest as you walk on the treadmill or use an elliptical machine. If that doesn’t work, try scheduling a play date or ask family members to watch the baby for an hour. It is important than you do schedule time for yourself. If you are not 100% healthy, how can your kids be 100% healthy?